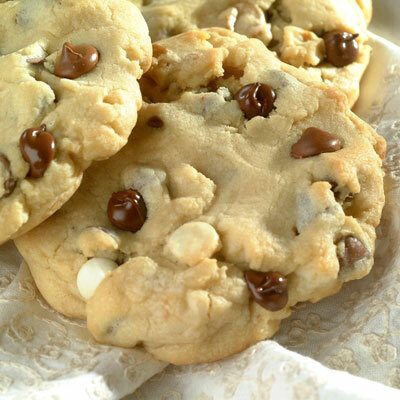 Jumbo 3-Chip Cookies are chock-full of chips and are a delightful and tasty choice for a special cookie treat. COMBINE flour, baking powder and baking soda in medium bowl. Beat butter, granulated sugar and brown sugar in large mixer bowl until creamy. Beat in eggs and vanilla extract. Gradually beat in flour mixture. Stir in morsels and nuts. Drop dough by level 1/4-cup measure 2 inches apart onto ungreased baking sheets. BAKE for 12 to 14 minutes or until light golden brown. Cool on baking sheets for 2 minutes; remove to wire racks to cool completely.